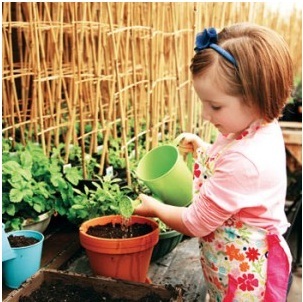 Almost every kids love being dirty and making home gardening as part of their activities will give them some fun. Let them pick whatever plant that they want to grow and for sure this will excite them. Those plants and flowers with bright colors are most likely to be choosed by them. Get more varity of plants and flowers for them to choose. Among the bright flowers are zinnias and cosmos as these will keep your kids fascinated. Always include the sunflowers . Make sure that your kids does not allergic to any of those plants. Let your children do the seeding. Their tiny fingers are suitable for those seeds which are too small in nature. Kids can get bored easily but you can keep their enthusiasm until the plant grow by making a journal for their home gardening. With this journal , they will sketch what plants that they would imagine of and begin to write their gardening activities stages from when they place the seeds until when they witness the sprout pushing up. Pick a spot where the kids often play or walk by as they can easily observe how the plant grow each time they see and pass by their garden. Our kids are fond to playing dirt or mud. They can help you in making ready the soil although it is just a stomp on the clumps. Provide them with kid-sized tools so that they can joint you with fun. Make a picture of each of the plants so that your kids can foresee what the flowers are look like. Make a placard and put your child’s name on it so that everybody can see that it’s their garden and that will make them proud of what they are doing. Playing with dirt means playing with water too for home gardening. Give them a small watering can so that they can water their garden. Show them how to let the water go right to the roots of the plant. Don’t give hoses as it is too big for little hands to handle. We, adults are sometimes impatient and make mistake too. Let the kids have full control of the garden. They mess it up, let it be. It’s their own garden and let them get the pleasure from it. The only thing that you can involve is by telling them to clean up the mess.